To be on the safe side, it is better to do as much research as possible on the vehicle which you are planning to buy. This is especially true if your intention is to buy a Toyota Prius which is a hybrid car. This car uses a powerful battery along with gasoline to run. So collect all available information about the battery before you buy the car. Toyota Prius was introduced into the US market in 2001 and very soon it became the most preferred car in the US. Statistics show that more than half of the total number of Toyota Prius produced in 2009 were sold to American buyers. This car is also certified by EPA as one of the cleanest cars as it doesn’t pollute the environment much. The Prius achieves its fuel efficiency because of a powerful battery used in it. It runs partly on the electrical energy produced by the battery. Only when the power from the battery is not sufficient enough to run the car, the gasoline engine is turned on. The power from the battery is enough to run the car slowly. Since the car needs to use gasoline very rarely, it is fuel efficient and environment friendly too. In most of the states in the US, the Toyota Prius car battery carries a warranty for eight years or 1000,000 miles run. But in California and seven other states, the battery warranty is extended to either 10 years or a run of 150,000 miles. If the battery fails to perform during the warranty period, the car manufacturer will replace the faulty battery with a new one. Since this car has been in the US market for the last 10 years, experience has proved that the battery of the car is really long lasting. In some cases, the battery lasts longer than what the car manufacturer had claimed. Though there are reports of 300,000 to 400,000 miles run on the original battery, 200,000 miles is what we can normally expect from the battery. Long life of the battery doesn’t mean that the battery will last forever. When the battery pack is no more able to store power in it, it has to be replaced by the car owner. Battery replacement will cost the owner somewhere between $2,299 and $2,588! In addition to the cost of the battery, there is labor and service charges too. The car manufacturer takes the initiative to recycle the battery when it is discarded by the car owners. This is a step taken towards keeping the environment clean. It spends around $200 for recycling each battery. For the convenience of the battery dealers, a phone number is printed on the battery itself to get more information about recycling the battery. Every part of the battery can be recycled and reused. 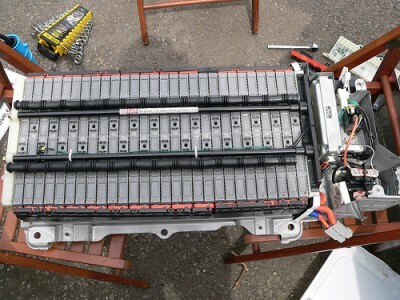 In addition to the nickel-metal hydride battery, Toyota Prius has a less powerful 12 volt accessory battery to operate the accessories of the car like fan, lights, computer and so on. This battery lasts for about 5 years and it costs just $150 to $300 to replace it. Though the cost of repair of a Toyota Prius is comparatively more than other vehicles, its operational cost is less. If you are interested in buying a Toyota Prius, think of the costly battery replacement problem. But considering the long term battery warranty and the proven performance record of the batteries, there is nothing much to worry about at least for eight to ten years from now. 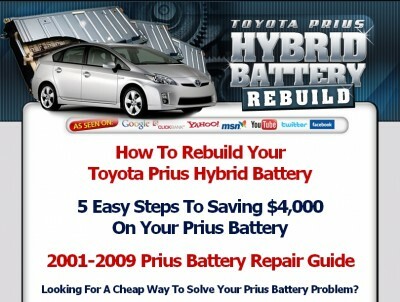 Are there any way for you to get Toyota Prius battery pack replacement for a cheaper cost or on a discount? As a matter of fact, there is. Check out the www.hybridbatteryrebuild.com web site. The creator, Pete, will show you how to rebuild your Prius battery versus replacing it. There is no certainty about the life span of Toyota Prius Hybrid Battery; there are some users who are not satisfied about the performance and life of such batteries. It was expected that the total life span would be for 200,000 miles and or for nine years. The total capacity of the Toyota Prius battery is only 60% of its original capacity as compared to other batteries, such a shortcoming shows a new scope of regenerative braking. It is normal that the charge level of battery could vary by 10%to15 %; this is the reason why the battery never gets fully charged.